This post about the Madewell Insiders June 2018 Perk contains affiliate links. Please read this blog’s disclosure post for more info. Are you part of Madewell’s free loyalty program, Insiders? If not I highly recommend joining as soon as possible as Icons (the top spending level) just received a very nice perk in our inboxes — $25 off our next purchase! During the year I’ve also received 20% off my purchase coupons, free gifts from Madewell (think beauty and accessories!). Perhaps best of all, as an Insider I enjoy free 2-day shipping on all of my orders. 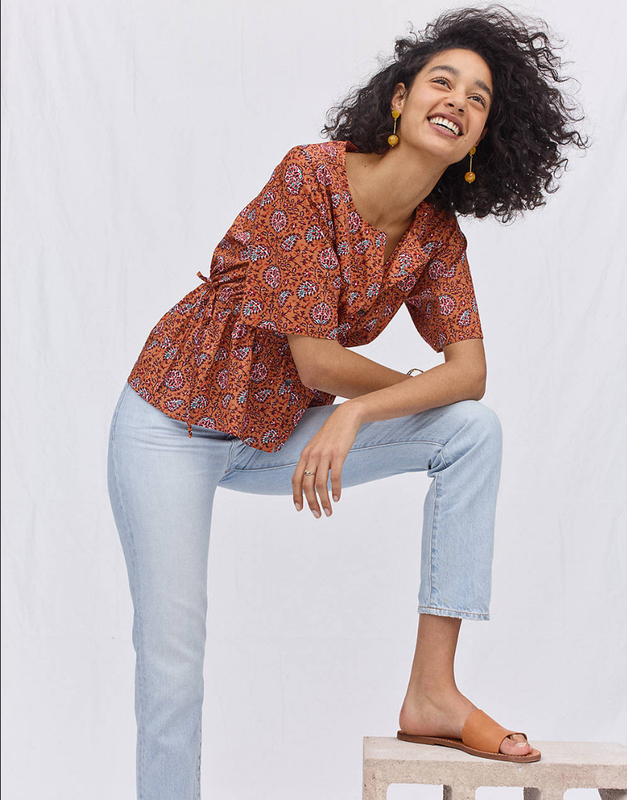 Of course, Madewell’s new arrivals and Summer 2018 collection are super cute which makes my purchasing decisions easy. The Madewell Insiders June 2018 Perk is a great bonus for stuff I was already planning to buy. Let’s take a look at some of the cutest new arrivals. There’s a ton of pretty new items at Madewell I’d love to use my Madewell Insiders June 2018 Perk on! I’m loving their eyelet this year. Though it’s hard to choose between the dress (on sale!) and the top, I’m leaning towards the Eyelet Sundrift Ruffle Top ($74, above) because I already own a few white dresses. I adore the cute ruffle sleeves and with a cami underneath this top looks great with a pencil skirt for work. I’m loving so many of Madewell’s tops right now! My favorite top is the butterfly top, which comes in several different weights, stripes and patterns. Come back later today to see one version on me! The Whisper Cotton Crewneck Muscle Tee ($19) promises to be a Summer staple for me. You’ll see more of my favorite tops in the shoppable boutique at the end of this post, and two more cute tops in the outfits below. I enjoy Madewell’s use of the same pattern across multiple disciplines. A shirt? Yes. A dress? Yes, that too! The Cutout Cami Midi Dress in Warm Paisley ($138, above) is a truly tempting item for my Madewell Insiders June 2018 Perk. I’m also drawn to the Posy Ruffle Dress in Twisted Vines ($168, see last year’s version on me here). These dresses also cry out for cute accessories, another area where Madewell excels. I own the Halliday Sunglasses ($65) in a few colors now. After losing my white pair (*tears*) the Indio Sunglasses ($55) might be their replacement. I love using Madewell’s Bandana (now $13) as a tie around my bag straps or a headband on windy days with our Jeep’s top off. Right now my favorite colors are the ‘sheer pink multi’ and the ‘sea glass multi’, both linked in this post’s shoppable boutique. It’s hard not to smile while perusing Madewell’s selection. I love their models right now, I love their items and I adore their perks!! Below, all my picks from the June Madewell selection. What are you loving at Madewell right now? You can check out more of their recent delights in this post on last month’s Madewell latest or check out my Spring 2018 Madewell OOTDs (1 | 2). I was so excited to see that perk in my email this morning! Already used it. Have a great day Roxy! Awesome Sara! Would you like to share what you got? Inquiring minds want to know! Kinda boring but I got the short sleeve white button down that ties. I think I will wear it a TON. And a necklace. All great picks Roxy! I really love the eyelet top in beginning of your post. I got mine emailed today and can’t wait to use it! Thank you Scgirl! I'm excited to use my perk as well. Thanks for sharing your picks, Roxy! I'll probably use my perk on the Shrunken Stretch Jean Jacket. Although I'm super tempted by the Donovan Sandal and either the Eyelet Midi dress or the Cut-out Cami Midi dress. I'm curious as to what you think of the Long Robe Jacket in Grid pattern. I love the look on the model, but doubt my short self could carry it off without looking totally overwhelmed by it. The review is from someone who is 5'5" and they like it! I think it looks oversized, haven't seen it myself in-store. So I'd recommend sizing down to keep it from swallowing you up. Very cool jacket. I was super excited to see the email yesterday but can’t decide what to get. Haha. Has anyone tried on the silk wrap tops that are on sale? I’ve had my eye on them for a while but don’t know if it’s too short for my liking. Then they turned on final sale and now I’m even more hesitant to pull the trigger and buy them. They vary in fit by which top you pick. For example the star scatter version runs very short, so I can't wear it all even with my short torso. The daisies version meanwhile is perfect length, bordering on running large! Which version are you interested in PHG? I wanted both! But thanks for letting me know about the star scatter one… I was leaning towards that one because it was black. So glad I didn’t order it! 🙂 I didn’t know it varied in fit (which is why I got confused the reviews were conflicting). Thanks Roxy!